Tobago dive sites offer a myriad of options for scuba diving in Tobago. Dive Tobago if you want to do drift dives on the North end of the island or explore the reef depths of the South end of Tobago. 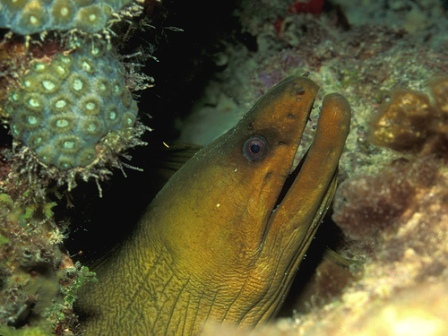 Divers have a choice of the best scuba diving sites on both the Caribbean and Atlantic coast. 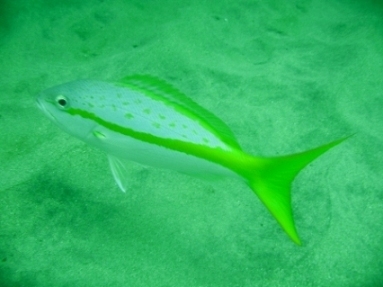 Tobago diving generally allows for drift diving due to local conditions. 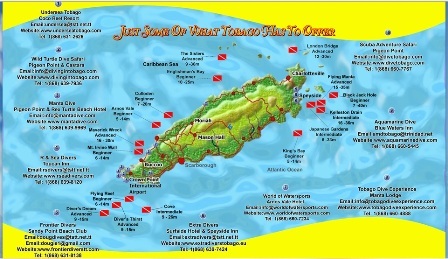 There are over 30 dive sites in Tobago. I got to dive some great spots with the wonderful dive operator Extra Divers of Tobago. Our daily dive guide Dion was quite an entertaining guy. He kept calling me "Charlie's Angel"...I have no clue why, (maybe he thought he was Charlie?) but it was quite amusing. We descended along the reef wall to 15 metres. The visibility that was about 8 to 10 metres. I even saw some scorpion fish mating! Since June is mating season in Tobago, we got to see some marine life, getting their groove on! While swimming along the wall, there were some banded coral shrimp nestled within barrel sponges, queen angelfish AND a school of 200 bar jacks . They circled our group for about 15 seconds and were gone just as fast as they came! The coral was healthy and was commonly seen in the company of barrel and tube sponges. This wonderful dive ended with a juvenile high hat drum and 2 octopuses courting each other. Stingray Alley is just off Crown Point on the South Western corner of Tobago. We descended to 16m with a visibility of 10 metres. Let me warn you, the island of Tobago is in the mouth of Venezuela's Orinoco river. The rich nutrients of the river feed Tobago's marine life however the visibility is affected especially during the rainy season from June to December. This dive wasn't as eventful as I expected. ...maybe because I wanted to see an overwhelming amount of stingrays cruising the ocean floor. We did manage to see a couple stingrays neatly camouflaged in sand. My excitement grew when we saw 3 eagle rays flying past us. 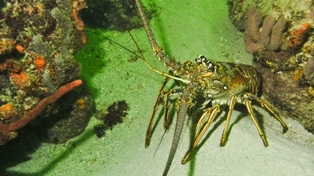 I spent the remainder of this dive attempting to photograph a Caribbean spiny lobster that fiercely guarded its home. 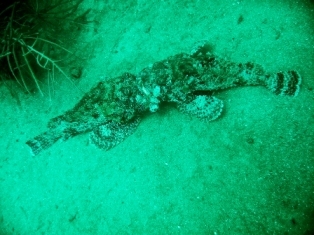 At Buccoo Channel we descended to 19 metres, it was mainly a wall dive with a visibility of 15-20 metres. We saw an array of healthy coral such as fire coral and boulder star coral. This was my latest Tobago dive site with Extra Divers! The rains had significantly reduced over the last few days and we were eager to dive the Mt. Irvine Wall. We boarded our trusty dive boat at the Bon Accord Lagoon and made our way to Mt Irvine. We made it down to the maximum depth of this site and the waters were soooo clear! It was the best visibility I had seen on this June, 2010 trip! It was a pretty easy going dive perfect for any beginner with very few currents. I thoroughly enjoyed this dive because there were so many ledges, cracks and gorgeous canyons to explore! I saw a spotted moray eel, yellowtail snapper, a hawksbill turtle, and another pair of scorpionfish mating! Yup...mating season was in full swing!